Certified organic maca (lepidium meyenii, walpers) Allergen Information: Manufactured in a facility that also processes tree nuts (Cashew). Maca root has been used in Andean cultures as a source of nourishment for many millenniums. It continues to be used today because of its superfood qualities. 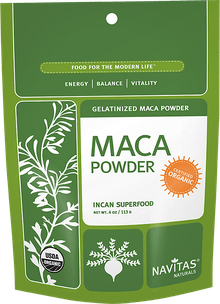 Maca is referred to as an adaptogen, which means it will help your body naturally adapt to stress and things like a busy schedule, hectic job, or illness. Consuming maca can make you feel more alive and energetic, and improves your sense of well-being. This maca is certified organic and comes from high up on the Junin Plateau in the Peruvian Andes. 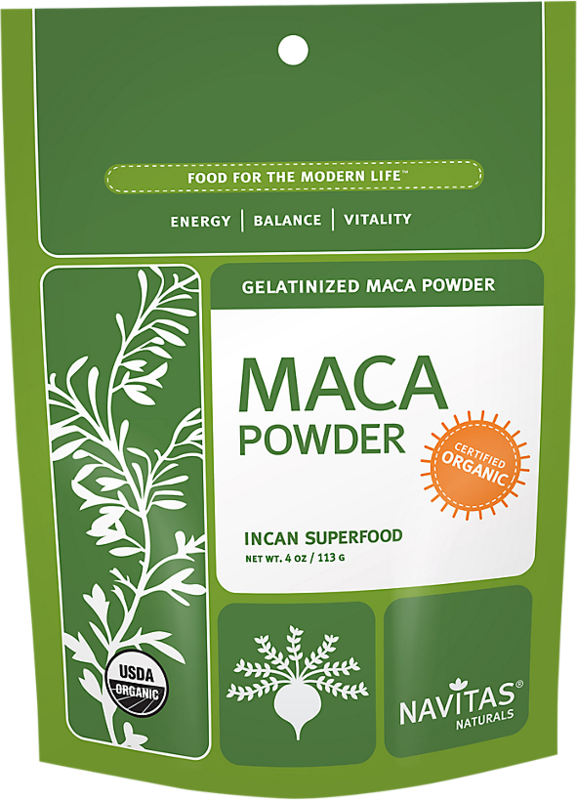 Maca is one of the few special plants that is able to thrive in this extreme ecological zone. The days are filled with intense sunlight while the evenings have high wind and freezing temperatures. After harvesting the maca roots, they are slow-dried and gently milled at a low temperature to keep the natural state of the food. Navitas Naturals Maca Powder is certified organic, kosher, and non-GMO. Maca is used to increase stamina, boost libido, and stop fatigue. It is a super adaptogen, enabling the body to regulate stress factors imposed upon it in everyday life. There are four alkaloids present in maca, which are known to nourish the endocrine system, responsible for producing and maintaining hormones. It is very nutrient-dense, packed with vitamins, plant sterols, essential minerals, amino acids, and good fats. Perfect for athletes in training. Navitas Naturals started in 2003 and aimed to bring superfoods to North America to revitalize the modern Western diet. They use superfoods from ancient cultures around the world. Their superfoods are nutrient-dense and are abundant whole food sources of antioxidants, protein, essential fats, vitamins, minerals and other key nutrients. Other Ingredients: Certified organic maca (lepidium meyenii, walpers). Allergen Information: Packaged in a facility that also handles tree nuts. Refrigeration not required.